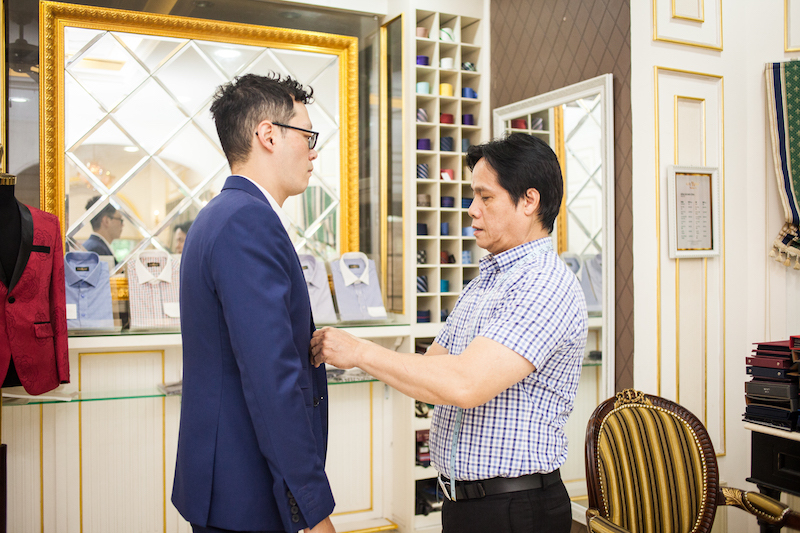 There are little to no reasons not to have a bespoke suit in Vietnam. The cost and availability of top quality fabrics and patterns makes the process virtually frictionless. The craftsmanship is comparable to anyone’s you will find in Italy or Hong Kong. The only reason I can see for one living in Vietnam or staying for extended period of time not to get a bespoke suit is that one just can’t decide what he wants from the myriad of variations. Let this article be just one example of the possibilities for a beautiful well fitting suit. I chose Gia Minh Tailor (31- D5 Biet Thu Saigon Pearl, 92 Nguyen Huu Canh, Binh Thanh; www.facebook.com/GiaMinhTailor), a local establishment not affiliated with any international hotel or located in a tourist area. It’s nestled in the Saigon Pearl luxury complex, a part of the townhomes adjacent to the high rises. They’ve only been at that location for the past three years, but bring over three generations of family experience. 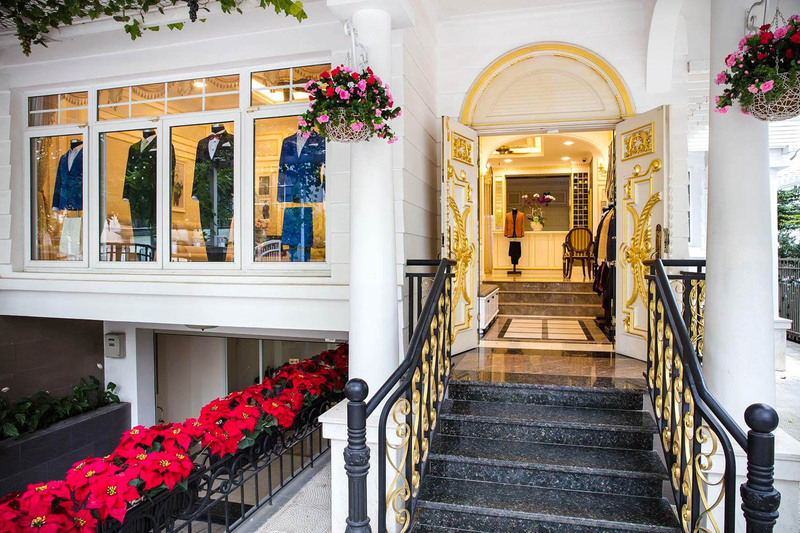 The original location being in Hanoi, Tuan Ly, up to his grandfather have been outfitting local celebrities, politicians and international dignitaries since 1948. Mr. Ly and his uncle operate this location. The first step, of course, is to get measured. This is the best moment you can tell Mr. Ly of any customizing beyond your personal measurements (ie. having a sleeve shorter for your wristwatch) rather than waiting for the suit or shirts to be made. After the measurements are recorded you choose from the more than 1,000 choices of fabric and colors. If it seems overwhelming, stick to the basics (navy, gray, charcoal, black). I know at times one is tempted to be a little more ostentatious with their bespoke suit—everything from a particularly flashy lining to extra short jacket length. All I have to say to that is to be careful not to come off as if you’re trying too hard. And a bespoke suit should be in your rotation for a lifetime. 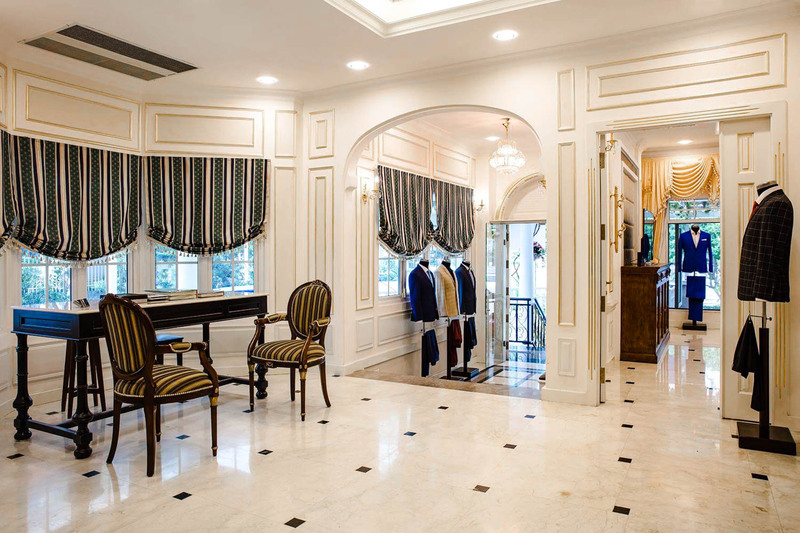 Wait to go bold by your third or fourth bespoke suit. I chose a classic solid lighter navy blue. Then the real fun part (at least for me) begins—the design. Mr. Ly will go through each design option, showing you sample pants and blazers to make the selection easy and with no confusion. I wanted the suit narrow and slightly slimmer, but not too tight. Too tight and you risk mimicking Mick Jagger and unless you’re a Brit pop star from the 60s, I would stay clear from it. Too wide and you might look like an extra from The Sopranos. Middle of the road—well, then you’ll look middle of the road. Of course each body type requires different cuts, hence bespoke always trumps buying off-the-rack. Mr. Ly is also very helpful in his recommendations and very astute to current fashionable trends for the younger generation. Always go with flat front pants. Side pockets on the trousers, I leave to your discretion: vertical slit or slanted pockets. I personally chose the slanted pockets as I found it to lay a bit flatter on my body. I have seen some go as bold as having horizontal pockets, but I found that to look a bit too casual. I requested a single back pocket just for giggles since I do not intend on carrying anything in my pants as not to disrupt the lines. To cuff or not to cuff? Keeping with the minimal look I went without cuffs and with just a wink of a break in the leg, letting the bottom of the pant legs kiss the top of the shoes. Note: always bring your own shoes to a fitting. I asked for a single breasted Saville Row cut or a British cut. You can, however, choose a mix of type of lapels, shoulder padding, to pocket flaps. I asked for personal embellishments of a ticket pocket that rests higher on the right hand side and for red stitching on the lapel buttonhole. The ticket pocket for a little “old-school” touch and the red stitching for a little detailed flair. 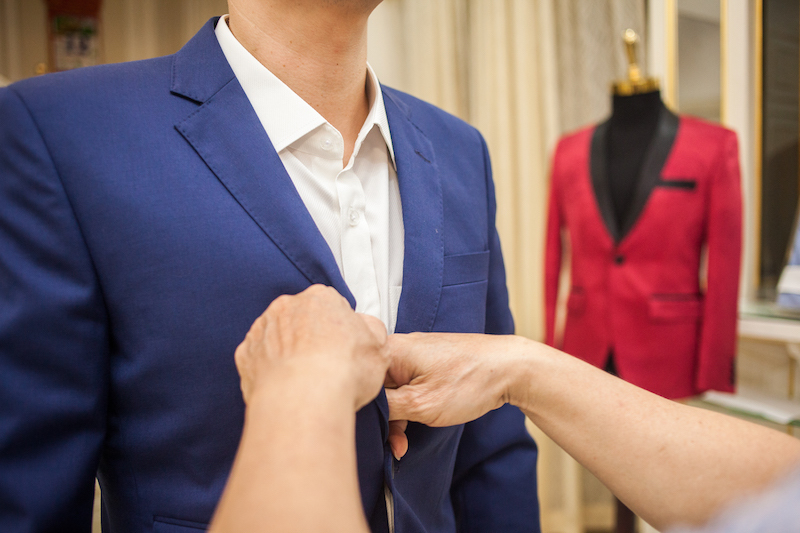 Depending on the availability of the fabric, most suits are completed within three to five days since everything is done on premises. You can even have it rushed for an extra charge if your time in Saigon is limited. 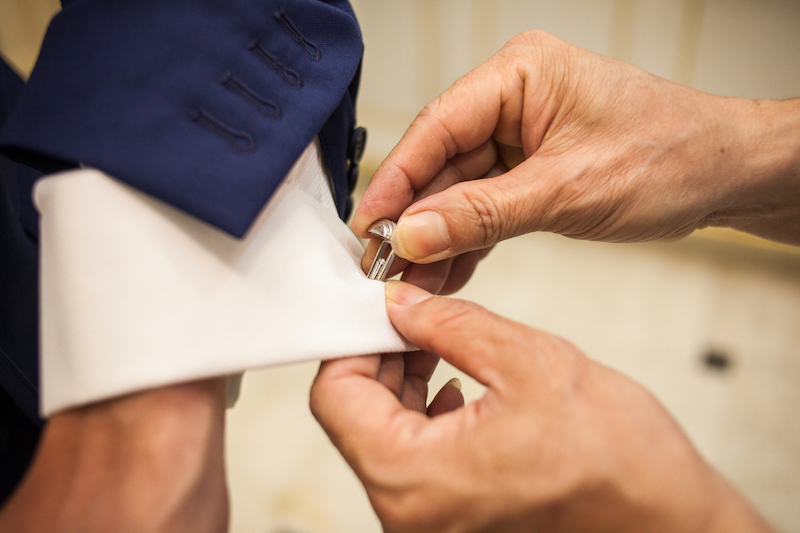 You’ll come in for the final fitting and any alterations will be made. For just a little bit of time and effort, you’ll walk out feeling like a style icon. 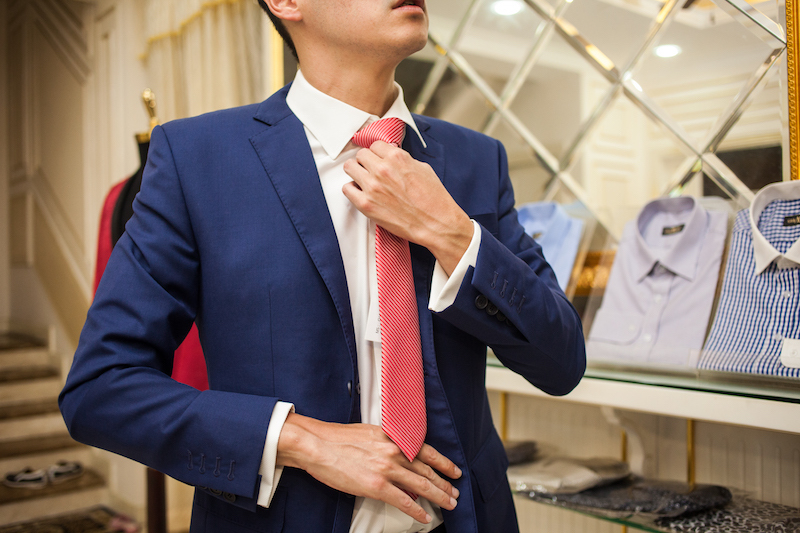 Suits start at VND3.8 million and increases dependent on choice of fabric; shirts start at VND500,000 and increases dependent on choice of fabric; and tuxedos start at VND4 million.